Retail property demand decline: softening of the retail side of the commercial property market. Outside of mall type properties, for which the sector has experienced big problems for the past 10 years, we've been waiting to see a decline in retail property prices in those places where rents had been stratospheric. In the US market, that's mostly NYC and submarkets like Fifth Avenue, where rents can exceed$1,000/s.f., a price that can only be justified if the site is treated in part as a marketing expense. The Wall Street Journal reports ("In New York, Retail Storm Arrives") on the price decline--retail rents dropped 18% in 2017. Over time, this will also impact local government budgets, as property demand declines will decrease the value of properties, their tax assessments, and tax revenues. Good malls, bad malls. Somewhere I saw an article that made the point that malls are doing fine in many places, it's the malls in middling submarkets that aren't doing well. Yep, that's been obvious for a long time. There's been a fair amount of coverage of malls adding other functions to the pads where department stores had been, from offices to fitness centers. But people miss the point of what this does. It helps to maintain the relevance of the location as a commercial property, but this comes at the expense of the retail character and vibrance of the shopping mall, because the new tenants aren't "anchors" in the same way as the retail destinations they replaced ("Sticking gyms in ailing malls won't work, and here's why" CNBC-TV). The point of "anchors" is that they draw customers who are in turn shared with other retailers ("TIF incentives for a department store in Georgetown," 2012 and "Why it's okay to give tax increment financing to department stores but you still need to think long and hard about where you put your money," 2007). But workers in office buildings and fitness center users aren't likely to do "shopping" at other places as part of their visit. "Lifestyle centers" were a response starting in the late 1990s to a decline in the power of the shopping mall because of a decline in interest in shopping at traditional department stores. Lifestyle centers were more oriented to shops and restaurants and outside spaces ("Lifestyle Centers vs. Traditional Commercial Districts," 2006), although here and there, department stores were an element of the mix. But the anchor wasn't a store per se but the "experience" in terms of the quality of the space and the focus on being outside rather than ensconced within an enclosed mall (cf. "Reeves Center and Georgetown Park are two sides of the same coin," 2007). Photo: Charles Fox, Philadelphia Inquirer. 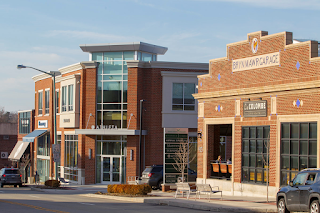 Bryn Mawr Village was constructed in part from an old bus transit garage. Lifestyling as the next generation of small shopping center development. An article in the Philadelphia Inquirer ("How Bryn Mawr Village found its Main Line shopping niche") discusses the evolution of this type of center, calling it "lifestyling," with a mix of fitness centers and other services complementing retail. The article is interesting in terms of the recognition that retail developers will continue to respond to changes in the market in order to remain successful. It keys on a developing change, that the property owners are less focused on attracting chain tenants that are ubiquitous, instead aiming for stores and services that aren't widely available elsewhere. I was surprised to see that the development has a number of independent apparel shops. But too, this particular center has the ability to be successful because it's in a high income area, and complements other destination retail centers like the King of Prussia Mall, one of the most successful in the US. It also has small scale office, which is increasing demand in an economy shifting from long term employment to "gigs," consulting, and independent contracting. That is an element that will be increasingly important to independent commercial districts. Another example that piling on debt or separating real estate from operations puts businesses at risk. 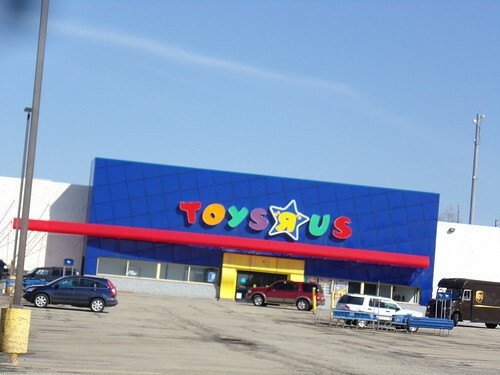 Toys R Us looks to be liquidating, not because they don't have the ability to reformulate their business through downsizing, but because when the company was converted to private ownership a few years back, it was saddled with huge debt (over $5 billion) and ongoing "management fees" to the private equity owners. The business isn't generating enough revenue from operations to pay off the debt. Concern in San Francisco about empty retail storefronts. The San Francisco Chronicle editorializes, in "Empty storefronts cast pall over city street life," about the decline of retail there, and offers some suggestions, which don't seem particularly powerful. Other ideas are surfacing. Some merchants favor commercial rent control to hang on to leases. Policymakers are studying higher fees if a property owner does nothing with an empty space. Both ideas need careful study in a tax-happy city that sees exactions and complicated rules as go-to solutions. 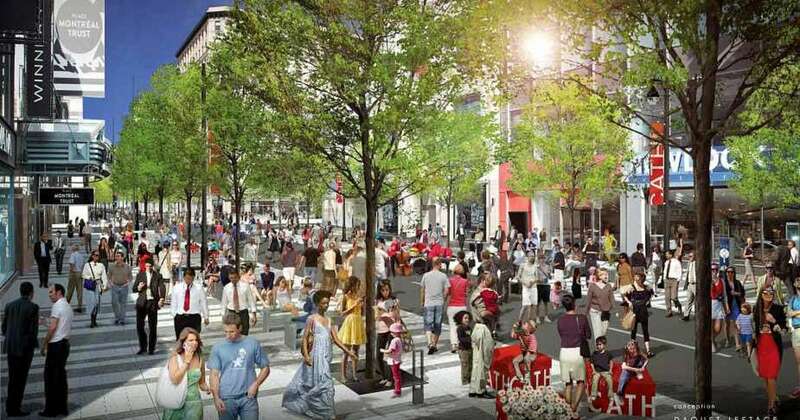 The vision for Sainte Catherine Street, although proposals such as heated sidewalks (to keep snow accumulation down) have since been dropped. Access to dozens of stores along the eastern stretch of Sainte Catherine that is now dug up has been cut off by construction barricades that limit pedestrian traffic – in some places to a single-file line. You'd have to be desperate for a Five Guys burger to navigate the construction barricades and holes outside the fast-food chain's main Sainte Catherine Street outlet. 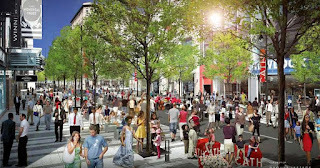 Also see "Montreal's Ste-Catherine Street about to undergo massive overhaul," Canadian Press). 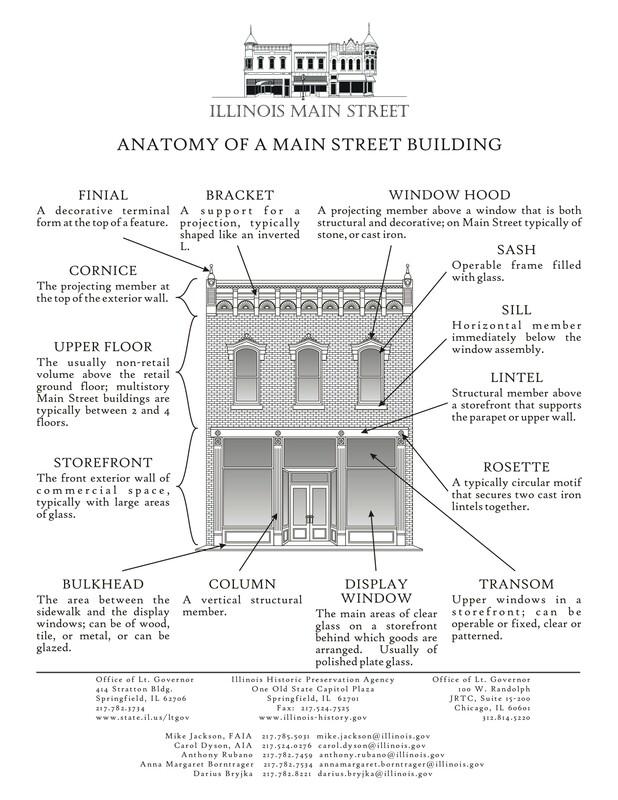 Recommendations for dealing with storefront vacancies and the desire for quality retail. WRT sparking retail renaissance in traditional commercial districts, key is to create the right kind of organizations necessary to facilitate it. While generally, government isn't the best place to foster retail innovation, there are best practice examples. Charge a CDC to deal with retail. First, is to create a community development corporation charged with buying and holding retail space, offering it at a discount from "market rates," while encouraging creative retail. The model is the SEMAEST Vital Quartier program in Paris. The program operates on a break even basis, and in some of the targeted neighborhoods, vacancies have declined by up to 40% ("Paris City Hall wants to revive Semaest," Les Echos). The program has assisted more than 650 individual businesses and controls 730,000 s.f. of retail space. Create a best practice retail development and assistance program. 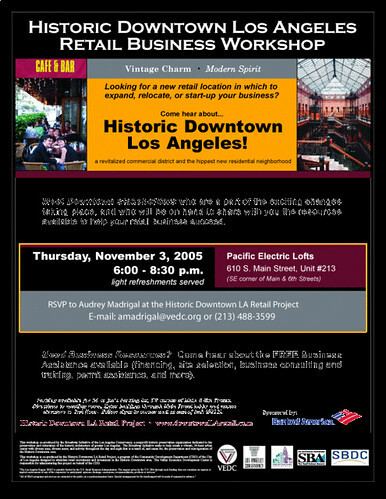 Second, to encourage and develop creative retail, create a companion program based on the now defunct "Historic Downtown Los Angeles Retail Project," to work with people interested in developing and launching creative retail and service businesses. Note though that it is often hard as hell to help existing businesses because often they think they know everything already. By default, it becomes easier to help new entrants, because they are looking for help and know they need it. This can cause resentments on the part of existing business proprietors, especially as they don't recognize their role in creating the problem. Recommendations concerning mitigating construction impacts on retail businesses. While it isn't uncommon for marketing assistance to be provided to retail businesses impacted by such projects, that tends to be the extent of the response. There is a lot of opportunity to be more thorough and innovative, to ensure that at the end of the construction, the corridor is in fact better performing not just infrastructure-wise but as a place, retail destination, and as a location to own and operate businesses. Lately too I have been thinking about how typically cities tend to not communicate very well about such projects, what they will accomplish and why the investment is important. (1) The TGM article mentions a number of retail developments that have been put on hold because of the construction on Ste. Catherine, including a new Saks Fifth Avenue store. The city should work with all those merchants to ensure that these projects remain in the pipeline and create a "master program" with the aim of "delivering" these projects as the construction project winds down, with promotion of the program ("The New Sainte Catherine Street!") throughout. (2) Provide a program of complementary investments in the existing businesses. (3) Along with ongoing marketing assistance and special events throughout the project. (4) And parking facilitation, such as integrated valet parking services for the corridor, subsidized by the city. (5) Try to negotiate rent relief for the businesses in association with the property owners and the city. In a memo to staff that has been seen by the FT, he said the coffee chain was “at a major inflection point” where landlords across the country would be forced “sooner than later” to lower rents “as a result of the acute shift (consumer behaviour) away from traditional brick and mortar retailing to ecommerce”. He pointed to “an ever-shrinking list of potential tenants to fill the empty store fronts within their [landlords’] retail portfolio that will blanket the country”, and not “a cyclical change in our occupancy expenses, but a permanent lowering of the cost of our real estate”. All this spells more damage to come for the US retail property sector, which has already experienced a wave of bankruptcies and restructurings that have hit demand for new stores. really good piece about the failure of music stores to focus on "the experience" of letting people try instruments. ILSR has a report on this. Mostly it's not that substantive. But a Portland program is comparable to the SEMAEST initiative, but on a nano scale. Platform LA retail development in the Hayden Tract, Culver City, Los Angeles as another example of "lifestyling"